This cake begins with four 5-inch white cake layers with a soft but tight crumb. 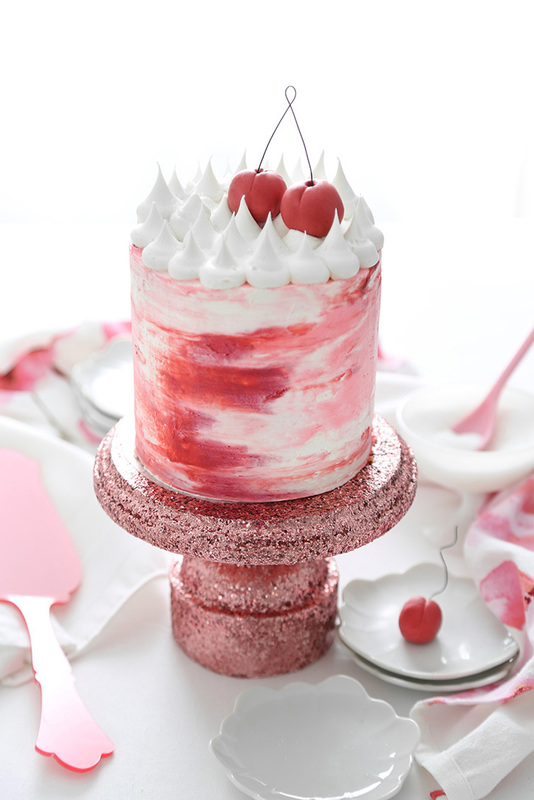 The firm texture will soak up a generous amount of cherry syrup, which intensely flavors the finished cake. The syrup is the usual 1-1 ratio of sugar and water boiled on the stove top, and then flavor is added. You can use your favorite cherry liqueur for this, but I opted for this pure cherry extract. Good cherry extracts are few and far between, but this brand delivers! My advice when using syrup on cakes is to to baste them like turkey (ha!) which involves a little time and patience. I usually infuse the cakes over a period of at least 1 hour, returning to re-apply the syrup as it disappears into the crumb. After the syrup is all used up, the layers are filled with cherry preserves. I use and recommend Tiptree Morello Cherry Preserve - so tasty! The watercolor frosting application continues to be one of my favorite cake decorating techniques. If you've never tried it before, you can see exactly how it's done with this Spirograph Cake video I made for Food Network. It's easy and so fun! 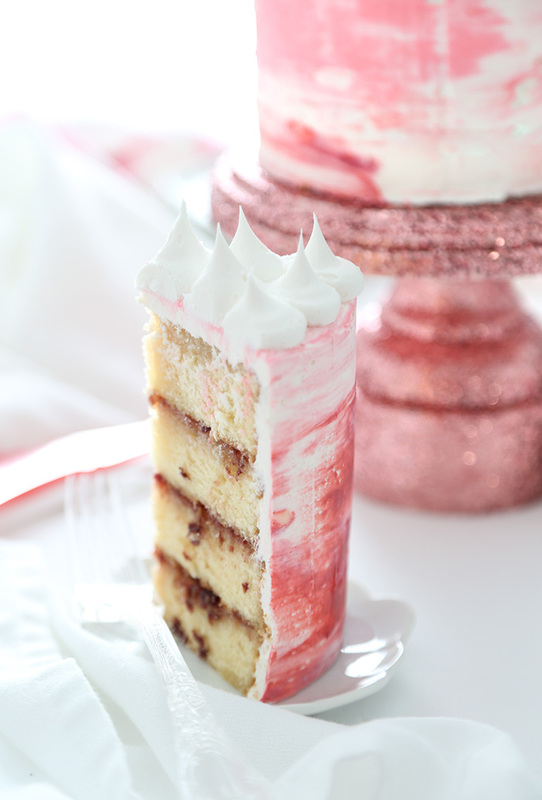 And how about that glitzy cake stand? I love it! There's a complete tutorial for making it on our new sister site called Confetti Fix. I created the site because I wanted to share some crafty DIYs that didn't fit well here on Sprinkle Bakes. It's still just a little baby blog right now (still under construction) but there are already a few fun tutorials there. Perhaps I'll make a more formal blog post about it in a few months, but right now it's just a happy place where creative ideas live. I opted for fondant cherries on top of the cake because fresh cherries are not in season. I'm glad I went with the sculpted cherries, because they have a slightly cartoonish appearance that makes me smile. The texture of the finished cake is so lovely with it's drenched but sturdy crumb. The Morello preserve offers fruity chunks of sweet dark cherry. 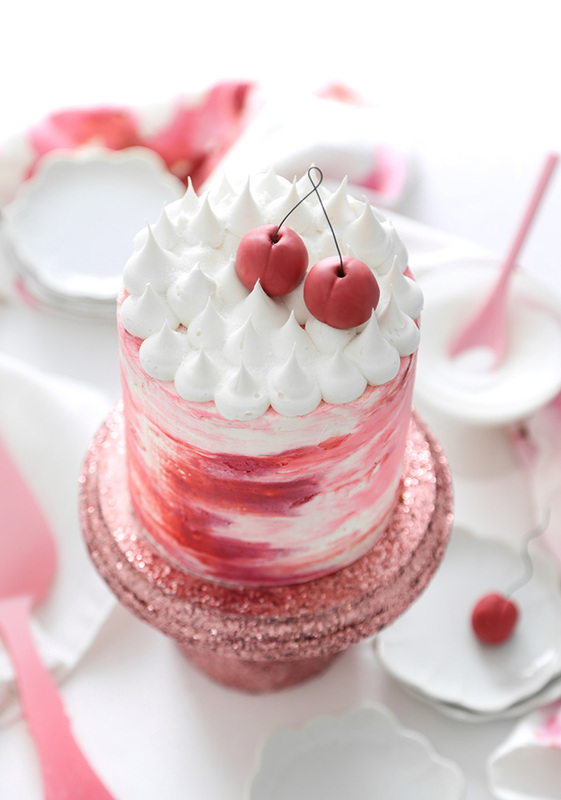 Altogether this cake is a cherry flavor bomb! 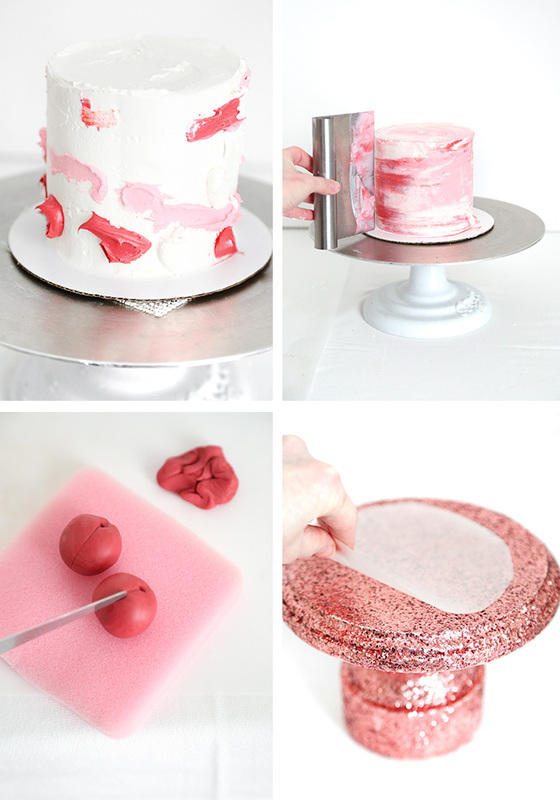 If you love the pink glittery cake stand, don't forget to check out the tutorial on Confetti Fix! Make the cake layers: Preheat the oven to 350°F. Grease and flour four 5-inch round cake pans. Whisk together the flour, sugar, baking powder, and salt in the bowl of an electric mixer fitted with the paddle attachment. Turn the mixer on low speed and add the cold butter one cube at a time. After all of the butter has been added, let the mixer run on low speed until the flour mixture resembles fine cornmeal, about 5-7 minutes. With the mixer still running, add half of the milk and the vanilla extract. Increase speed to medium; mixture will be thick. Add the remaining milk and egg whites. Beat until just combined on medium speed. Stop the mixer and scrape down the edges of the bowl. Fold batter with a rubber spatula until the mixture is consistent with no streaks or pockets of flour remaining. Divide batter between prepared pans. Bake for 17-22 minutes, or until a toothpick tester comes out clean. Let the cakes cool in the pans for 5 minutes before turning onto a wire rack to cool completely. Level the cakes evenly using a cake leveler or large serrated knife. Make the cherry syrup: Combine the water and granulated sugar in a saucepan and bring to a boil. Stir until the sugar is completely dissolved and remove from heat. Let cool for 10 minutes and then stir in the cherry extract. Liberally apply the syrup onto the cakes using a pastry brush. Re-apply until all the syrup has been used. 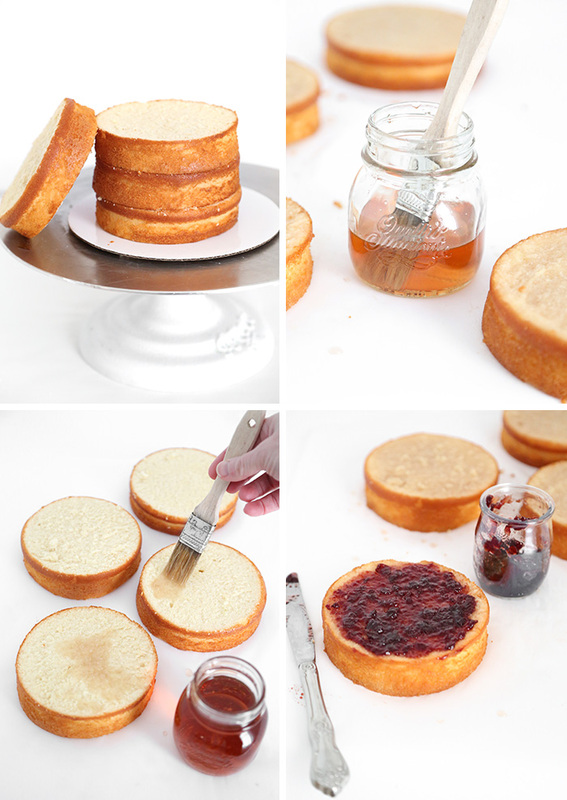 Place a cake layer on a cake board and cover with 2 tablespoons Morello cherry preserves. Center a second cake layer on top and spread on 2 tablespoons preserves. Center a third layer on top of the second, and spread with 2 tablespoons preserves. Top with the final cake layer. Make the buttercream: Place the butter in the bowl of an electric mixer fitted with the whip attachment and beat until lightened in color and fluffy. Add the confectioners’ sugar and beat on low speed, gradually adding milk or cream a little at a time until the mixture thins to spreading consistency. Whip on high speed for 5 minutes. Remove approximately 1/3 cup of the frosting to a separate bowl and tint it using a few drops of the rose, and a teensy amount of purple and yellow gel food colors. Add color a little at a time until a deep reddish-maroon color is achieved. Remove another 1/3 cup of frosting to a separate bowl and tint with the pink gel food color. Cover each of these bowls with a damp paper towel so the frosting doesn’t dry out. Use some of the untinted (white) frosting to crumb coat the cake; refrigerate until firm. Apply a second coat of white frosting and smooth evenly using an offset spatula. Dot the sides of the cake randomly using the maroon and pink frosting, and then use the edge of a bench scraper to smooth and blend the colors together on the sides of the cake. Transfer the remaining white frosting to a piping bag fitted with a plain 1/2-inch round decorator piping tip. Pipe peaks (Hershey kisses shapes) on top of the cake. 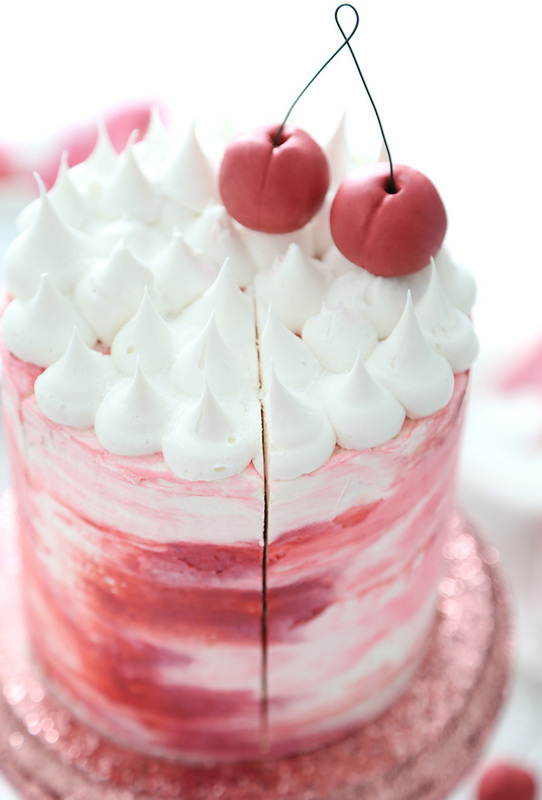 Transfer the cake to the refrigerator to firm while you make the fondant cherries. Make the fondant cherries: Knead the fondant until smooth and pliable. Add a little confectioners’ sugar if the fondant is sticky. Tint the fondant using the rose gel food color, and very small amounts of the purple and yellow food color until a reddish-maroon color is achieved (use gloves to avoid staining hands). Divide fondant in half and roll into two balls. Score each down the centers on each side using the back of a butter knife, creating the contours of a cherry. Use a skewer to poke holes in the centers of the cherries. Twist a 6-8-inch piece of fabric coated wire in the center and insert the ends into the holes in the cherries. Transfer the cherries to the top of the cake. Thank you,you make it so simple, Heather! Best wishes for Confetti Fix! Hi, Heather: Could I use two eight inch or nine inch pans? I don't have four five-inch pans. Thank you for your help! Hi there! Yes, absolutely! This recipe will work in two 8 or 9 inch cake pans.